US producer Nick Terranova AKA Starkillers has been cutting a swathe through the bolshier end of the global house music scene with his tough-edged, eclectic sound and is now set to release 'Total Destruction' with Netherlands’ based DJ Tony Junior on Steve Aoki's Dim Mak Records. Starkillers is known for his blend of high-octane, fierce energy beats, blending big hooks, riffs, thumping bass and effects trickery which has made him popular to collaborate with. This new track follows on from 'Let The Love', his first official release of 2013 with fellow producer Dmitry KO and vocalist Amba Shepherd, which dropped on the Dutch imprint Spinnin' Records. The track was premiered by BBC Radio 1 and Tiesto and notched up over two million YouTube hits. 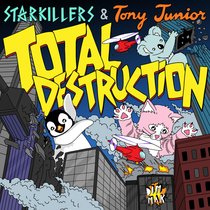 Now he returns this time with Tony Junior with their 'Total Destruction' release. With upcoming releases, remixes, collaborations and a major tour of his home turf in the USA, it looks like a busy 2014 ahead. Check it out below, it’s out January 21.